​This article discusses details about before, during, and after executing a tennis stroke. Every time my tennis students make a mistake, no matter what the cause, I ask them to give partial blame to one of the three tennis absolutes and make adjustments accordingly. I use the following sentence to help my students remember the three important tennis absolutes (Breathing, Vision, Footwork): Breathe, see the ball better, and take everything early. 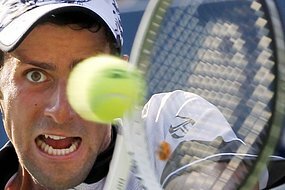 A great concentration technique for tennis is to expel a small breath of air at the exact moment of racquet string-to-ball contact, the most important part of any tennis stroke or hit. Try saying the word focus at the exact moment of string-to-ball contact during tennis practice sessions. Air is expelled when you say a word. Say the word focus (meaning to mentally focus your attention or vision) and do exactly what you are saying. This allows air to be expelled at contact and serves as a reminder for the student to focus their attention or vision at ball-to-string contact. A relaxation technique that works very well for tennis players is to SLOWLY take three full deep-breathing cycles (complete inhale and exhale) to help eliminate body tenseness. Relaxing helps you to self-compose and begin to regain the necessary sharpness of the mental functions required for higher levels of competitive play during matches, or to be able to engage in corrective methodology (error analysis and over-correction) during practice sessions. Immediately after striking the ball you should visually estimate and then move to a location on your half of the tennis court from which you believe you will have approximately the same chance to respond to any kind of stroke or hit from your opponent. Your preparation vision begins immediately after you strike or hit the tennis ball. Begin watching your opponent’s footwork, shoulder turn, and tennis racquet preparation to get clues about ball speed, trajectory, angle, and spin. By reading your opponent's shoulder turn and racquet preparation you should be able to establish approximately where and how fast your feet will need to move to get you set up for your next hit or stroke. Reading the opponent's shoulder turn and racquet preparation can tell you where your feet need to go before the incoming tennis ball can reveal the same information. NOTE: When the ball bounces on the other side of the net, you should be too busy reading the opponent's shoulder turn and tennis racquet preparation to pay close attention to the tennis ball, until it comes off of his or her tennis racquet strings. After watching the tennis ball bounce off of the opponent's tennis racquet strings (to get clues about any spin and force being applied), look for the yellow "V" the ball makes immediately before and after touching the court surface on your side of the net. The ball will give up a certain amount of speed when it bounces and may take path changes, due to spin being applied. Note: On a sunny day, practice watching the bouncing ball meet its shadow. 3) Draw an imaginary ball flight line through the center of the tennis ball immediately before striking the tennis ball. This line must be precise in degree of arc to allow for net clearance, the primary target in tennis. Adjust the bevel of the racquet face (string surface), up or down, according to the type of stroke or hit intended. Next, consider the racquet head speed needed for the ball to reach its intended depth in the opponent's court, the secondary target in tennis. Intended elevation and depth determine the necessary racquet head speed. Imagine how you would plan an intended line or flight path for an arrow. How far back the bow-string is pulled determines the speed of the arrow's flight; the arrow's speed determines the elevation necessary to reach its target from a given distance. This is very similar to planning the tennis ball flight, different heights require different amounts of tennis racquet speed. Pick a spot on the tennis ball to begin an imaginary line which cuts through the center of the ball and extends over the top of the tennis net with a precise amount of net clearance. For ground-strokes from the baseline, this line usually has some degree of incline, to allow for net clearance, and takes the shape of a fairly flattened out rainbow. When the ball is struck very hard, this line seems to be almost parallel to the horizon. Note: Lower speeds require more elevation to reach the same distance, much like archery. Immediately before striking or hitting the tennis ball, focus your frontal vision exactly at the proper string-to-ball contact point for your intended stroke or hit; This allows you to more accurately time the meeting of the approaching tennis ball to your tennis racquet strings within the proper part of your stroke or hit. NOTE: Prior to contact, focus your attention on the pre-contact side of an imaginary line through the tennis ball which extends to a primary target of net clearance. Upon string-to-ball contact, keep your eyes focused on the tennis ball until it has left the tennis racquet strings. NOTE: As the ball meets the strings, shift your visual attention to the post-contact side of an imaginary line through the tennis ball in order to control the racquet until the ball is off the strings and on its way to the primary target of net clearance. During practice sessions, I often encourage students to do the opposite of looking up too soon by asking them to keep looking at the place the ball vacated upon contact. Sometimes, I ask my students to close their eyes after string-to-ball contact is made; they pose in the follow-through position, having never looked to see where the ball went. Of course, this is only intended to be an over-correction to help fix looking up too soon (before the ball leaves the strings). Every step of a tennis player's purposeful footwork should happen with the intention of getting his or her shoulders into the best possible position to be able to properly time the meeting of the approaching tennis ball and the tennis racquet strings to happen at a very specific contact point within each of his or her strokes or hits. A properly timed contact point, coupled with just the right amount of shoulder turn, allows each stroke or hit an opportunity to guide the tennis ball forward on a controlled flight to a predetermined target within the bounds of the opponent's court, if the necessary amount of racquet bevel, speed, and attention (mind and vision) are also used. Footwork (mobility) is necessary to play the game of tennis. Improving patterns of footwork (preparation, execution, recovery, and between points) can greatly aid the successful execution of every tennis hit or stroke. Whether it is our feet or a wheelchair, we need some form of mobility to be able to cover the entire tennis court while playing tennis. We do have various options for our patterns of footwork; however, mobility is an absolute of tennis. Every step that the feet take during the preparation phase of a tennis point or rally is taken for the purpose of getting the shoulders into the best possible position to make the kind of tennis stroke or hit that a player desires to make. A good shoulder position requires that the player's shoulders be neither too far away nor too close to the tennis ball. Another important footwork and shoulder consideration is that the tennis racquet-to-ball contact point is far enough forward (toward the net) so that there is a desirable amount of body weight behind the stroke or hit. This footwork follows the preparation footwork, as much as time allows. Execution footwork patterns are quite often determined by whether the intended tennis stroke or hit is a relatively stationary stroke, a side-to-side running stroke, or a forward or backward moving transitional stroke. A tennis player does not always get to choose his or her execution footwork style. Quite often, the execution style depends greatly upon the location, inside or outside of his or her court, from where a tennis player hits or strokes the ball, and how much preparation footwork time is available, before execution footwork must begin. Faster preparation footwork often allows a tennis player to experience some extra ready time. During practice sessions, I encourage my students to speed up their recovery and preparation footwork and to begin counting as soon as they are in a ready position. We do this to gauge how much extra ready time they were able to gain by using faster recovery and preparation steps. Your recovery footwork should begin immediately after the tennis ball leaves your tennis racquet strings. Rapid recovery footwork, in any direction, allows a tennis player more time to get into a neutral position on his or her side of the tennis court so as to allow the best chance to react to the most likely tennis shot the opponent will make. Whenever time allows, recovery footwork should be completed before the opponent's tennis racquet strings strike the tennis ball. If a tennis player is performing transitional footwork when the opponent strikes the tennis ball, he or she should perform a split-step. A split-step is a slight forward hop that leaves the player's weight on his or her toes, knees slightly bent, and feet a little more than shoulder width apart; this act puts the player in a position to be able to more easily respond in any direction to the incoming tennis ball. A player should maintain a purposefully relaxed pattern of walking around the tennis court area when the tennis ball is not in play. This time might be spent trying to plan strategies to use against an opponent. Tennis strategy requires that you go inside your own mind to retrieve mental pictures or memories to make future tennis plans. Your best tennis happens when your mind is sharply focused in the present moment. After tennis planning and before resuming play, come back to the present moment by allowing your eyes to resume supplying pictures of the present moment, or the here and now. A slower than usual walking pace serves to help a tennis player stay relaxed and allows more time to contemplate a deliberate plan of action before play resumes. When things are going your way, a faster than usual walking pace can help you to accomplish more during times when you have the momentum in a tennis match. Shoulder turn is a tennis variable. Controlling how much shoulder turn you use to take your racquet forward or backward to a ready position before starting a stroke or hit is a tennis variable which allows you to increase or decrease potential power and have more control over being able to hit any court angle with your stroke or hit. Shoulder turn, in either direction, changes your available angles into your opponent's tennis court for your stroke or hit, because turning your shoulders moves your racquet-to-ball contact point, which changes the angle of your ball flight.